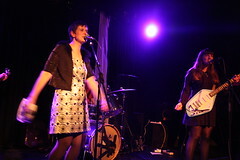 This past weekend, I went to the London edition of the Chickfactor indiepop zine's 20th anniversary gigs. The zine was founded in 1992 by two American girls, Pam Berry and Gail O'Hara, and whilst its printed output has tapered off somewhat (though issue #17, now funded through Kickstarter, is coming out soon), has continued as a website. Consequently, they've been organising commemorative gigs throughout this year. Earlier this year, I had flown to New York to attend the Brooklyn gigs they organised, largely because it was quite possibly my only chance to ever see The Softies play live (and it was worth it and then some, but that's another post). Anyway, Chickfactor had for a long time had a connection to London; having been founded by American indiepop kids, a subculture with an inherent Anglophilic streak (often coloured by a stylised, mildly anachronistic swinging-60s aesthetic; witness the summer dresses and severe Mary Quant bobs favoured by girls in the scene). One of the founders, Pam Berry (also of Black Tambourine) married an Englishman and ended up in London, while the other, Gail O'Hara, spent some time living in London in the early 2000s, and had a weekend festival, Mon Gala Papillons, at Bush Hall in 2004 (one of whose nights I ended up attending). So a London festival was only a matter of time. I didn't go to the film screening (of Take Three Girls, the documentary about post-punk girl band Dolly Mixture, which I had seen before) on Friday, largely because I had already bought a ticket to the Rodriguez gig at the Roundhouse (which was great, incidentally). I went to the Saturday evening gig (back at Bush Hall, around the corner from where I used to live, but inconveniently far from everywhere else), and to the Sunday afternoon/evening gig, which was held at that haunt of London indiekids of a certain age, the Lexington. Saturday's gig started off with Amor de Días, Lupe from Pipas' new project with her partner, Alasdair from The Clientele. It was as one might imagine; more languid and dreamy than the indiepop of Pipas, and redolent of the psychedelic folk of the Sixeventies in its languor. They were followed by the Would-Be-Goods, a band started by the teenaged Jessica Griffin in 1987, launched with a mildly saucy song about modelling for the photographer Cecil Beaton, which they followed with some highly literate pop songs. The Would-Be-Goods have kept to the jangly indiepop formula for the most part, though have matured somewhat in their themes; whilst some songs are set in the language of youthful friendships and crushes that is the idiom of indiepop (Temporary Best Friend, for example), others anticipate old age and its miseries (Too Old, for example, a song which sits next to Platinum by their fellow él Records alumnus Momus in the canon of starkly, heartrendingly beautiful meditations on the passing of time and all of its crimes). Shortly after the Would-Be-Goods' set finished, the room started to pack out in anticipation of The Aislers Set. They did not disappoint; they tore the roof off the place, much as they had done in Brooklyn. The evening was rounded off nicely with The Pastels, who played a mostly mellow set. Sunday started with The Starfolk, a husband and wife duo from the US, who played a guitar-driven pop. They were followed by Harvey Williams and Josh Gennet (who had been in a band named Holiday in the US), who played a selection of songs (mostly Harvey's, with some of Josh's and some covers of female singer-songwriters; their version of Broadcast's “Colour Me In” was lovely). Harvey hadn't been busy at work on new material, though had one recent song (“Quiet Domesticity”, a paean to staying at home) and had updated The Girl From The East Tower with a verse about the aforementioned girl losing her job (which turned out to have been at the BBC, where Harvey also works) due to not willing to relocate to Salford. The Real Tuesday Weld played a set a bit later, and had morphed into a more swing style in the years between their initial dealings with Chickfactor and now. They were followed by Pipas; it was great to see them. They had a new song, The Occasion, which they débuted at the Chickfactor 2012 US dates, though it has evolved slightly since. The night was rounded off with Tender Trap, Amelia Fletcher's band, who rocked harder than I expected; stand-up drums, skronky guitars and female vocal harmonies, backing vocals themed with the old youthful themes of boyfriends and girlfriends and such; Amelia seems to do such pop better than the more grown-up themes and mellow sounds of her previous Tender Trap albums. One thing that was inescapable at the Chickfactor gig was a sense of the passage of time. It was the 20th anniversary of a zine from the golden age of zines (after desktop publishing made them cheap and quick, but before the internet made them redundant as a means of communication) and arguably of a certain type of indiepop, and many of those who were involved back in the day are approaching or well into middle age, often with children. (The drink coasters printed for the US dates read “doing it in spite of the kids”.) It was interesting to see how the indie kids of yesteryear squared their love of and identification with an intrinsically youthful genre with their age and adult roles in life. Harvey Williams wrote a song, with the dry wit familiar to those who remember Another Sunny Day and his solo album on Shinkansen, about the mild joys of not going out (a contrarian stance which parallels the anti-machismo of his youthful work, along with that of his Sarah Records peers). Jessica Griffin, who (whilst presumably still in her 30s) wrote a sad song about the ravages of aging, doesn't expect to be still doing this sort of thing in ten years' time, while Amelia Fletcher has taken the opposite route, embracing the formalism of indiepop as ballads of youth in the vinyl record age (her band's previous album was titled Dansette Dansette, after a 1960s-vintage record player), can see herself singing songs about boyfriends and girlfriends (and, presumably, the ideal boyfriend's record collection) when she's 80. Anyway, photos are being posted to the usual place. I managed to get some video with my iPhone, which has been collected here. Check back here in some 10 years' time for reportage from the Chickfactor 30th.